If you are heading to the Highlands & Islands to fish for Salmon, Sea Trout and Wild Brown Trout these are the flies to bring. Make two fly 'Hebridean Casts' with them. Something bushy on a dropper and a slimmer fly on the point is an ideal tactic to tempt any Gamefish. Smaller flies on the loch will tempt Salmon when larger flies fail. Of course on another day the larger flies will work! The flies tied on Kamasan hooks are ideal for all gamefish. The fine wire specials are intended for light line (AFTM #4) Wild Trout Fishing. Natural colours will work when brighter flies fail and black does not work everytime! A shocking pink variant, try when all else fails. Red is a killing colour and this fly has plenty. All time favourite always worth a cast. Blue is a proven attractor of Sea Trout and Salmon. 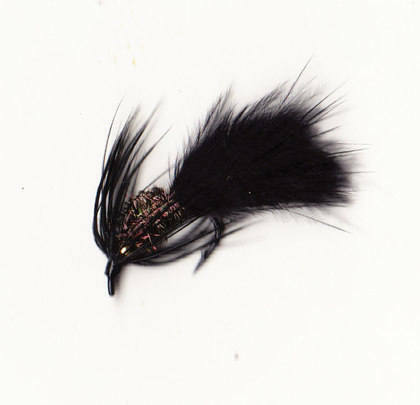 Tied with a slim wing and 360 degree hackle. Again an essential fly for any water. Useful fly to try when all else fails. The next three flies are tied on VMC #14 Lightweight Double hooks. Ideal on the point with other patterns on a dropper. They will tempt fish on loch, river and saltwater. Salmon will often take small flies. These are tied on fine wire hooks which although stronger than they look need to be used with care. On most days a #4 weight line is heavier enough to cast - even in high wind - a light soft top 9ft rod and 2lb leaders result in few lost fish and lots of fun! This is the first fly to try in a ripple. The longer shank hooks is easier to un-hook and ideal for catch and release. This fly will bring fish up even if they are not rising. Lots of leggy flies in the Highlands and Islands of which the Daddy Long Legs is king. 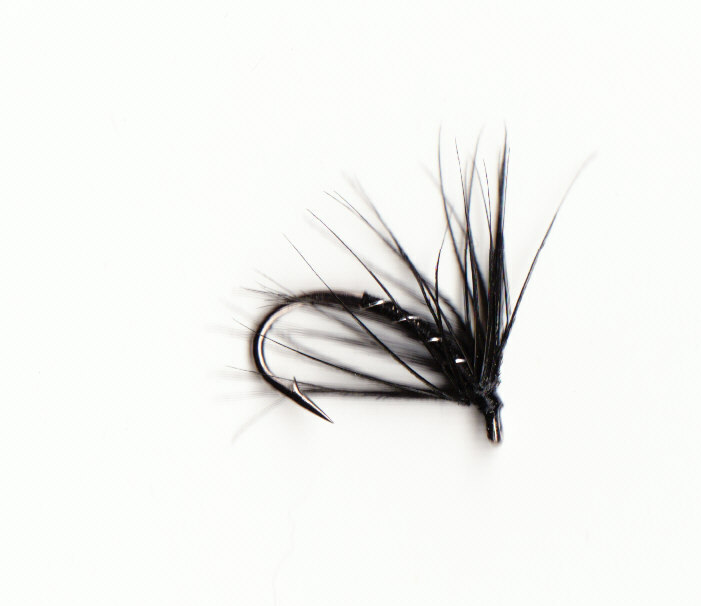 Tied with lots of straggle and long hackles this fly bounces of the waves - just like the natural. This fly works better than prettier Daddy patterns. Again good in a wave or ripple. The next two are for flat calms and light ripple conditions. Tied on Longshank #16 hooks these are first choice when fish are choosy. It has a happy knack of picking up larger fish. This is tied on a small hook and works when all else fails. Cast into the area where fish are rising and leave. The fish are usually on the cruise and will - with luck - find it! What to do when fish will not take Dryflies? All fish spend more time feeding on the bottom of waters than near the surface. Try these weighted flies to fish deeper with with the same #4 outfit you used to present the dryflies. Great search pattern to try when fish will not come up. Cast across wind and let the drift fish the fly. Retrieve line to keep in touch with the fly rather than move it. Try if the olive fails. Subtle tying that works on any water, including saltwater. Completes the set. At the end of the day you can usually rely on black flies. Use the same 9ft AFTM#4 rod but use a 4lb leader, the dropper benefits from the thicker stiffer nylon. First choice in a wave, makes a lot of noise and brings fish up. Age old classic fish with complete confidence.